The Washington Post reports that Obama told Gates and Secretary of State Hillary Clinton in October 2009, "I'm not doing 10 years ... I'm not doing long-term nation-building. I am not spending a trillion dollars." "Everything we're doing has to be focused on how we're going to get to the point where we can reduce our footprint," Obama says in the book, according to the Washington Post. "It's in our national security interest. There cannot be any wiggle room." During an interview with Woodward in July, the president said, "We can absorb a terrorist attack. We'll do everything we can to prevent it, but even a 9/11, even the biggest attack ever . . . we absorbed it and we are stronger." The CIA created, controls and pays for a clandestine 3,000-man paramilitary army of local Afghans, known as Counterterrorism Pursuit Teams. 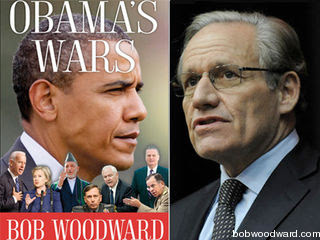 Woodward describes these teams as elite, well-trained units that conduct highly sensitive covert operations into Pakistan as part of a stepped-up campaign against al-Qaeda and Afghan Taliban havens there. Bonus factoid: The White House likes the book. According to Politico, which wrote two stories on Woodward's tome, officials believe the portrait is flattering to the president. The president comes across in the [Afghanistan] review and throughout the decision-making process as a commander-in-chief who is analytical, strategic, and decisive, with a broad view of history, national security, and his role. Politico also reported that the White House made a calculated decision to work with Woodward.